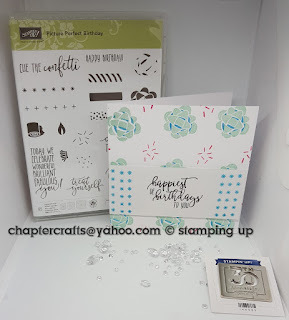 First you need whisper white card stock cut to 9 7\8" x 4 7\8" and score @ 4 15\16"
Stamp the ribbon image stamp randomly on the cards base in tempting turquoise and soft sky ink. The using the confetti stamp randomly stamp in melon mambo. Whisper White card cut to 4 7\8" x 2"
Stamp your sentiment in basic black ink and decorate with tempting turquoise ink. You can change the colours to make this card for a female or male.